25 Comments	This post may contain affiliate links. 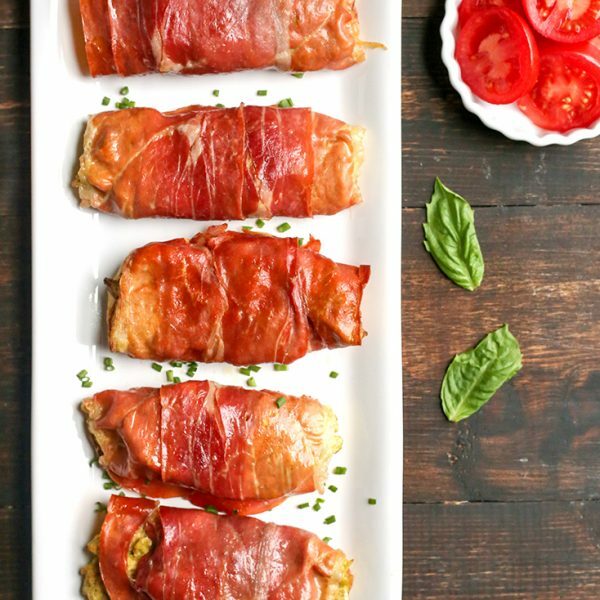 This Paleo Pizza Chicken has all the flavors of pizza- stuffed into a chicken thigh. Easy, delicious, and healthy! 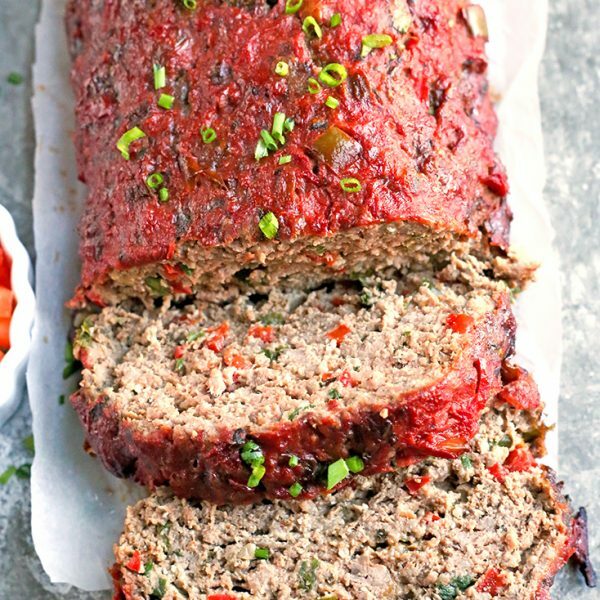 Gluten free, dairy free, Whole30, and tastes amazing! 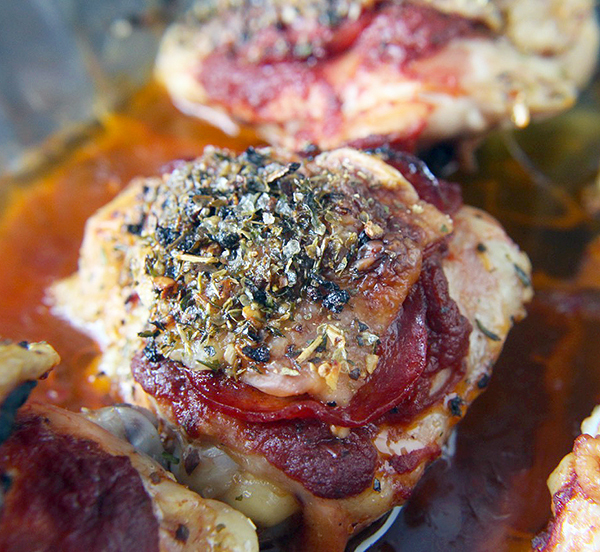 Chicken thighs are one of my favorite things to make! They are packed with flavor, easy, and cheap. 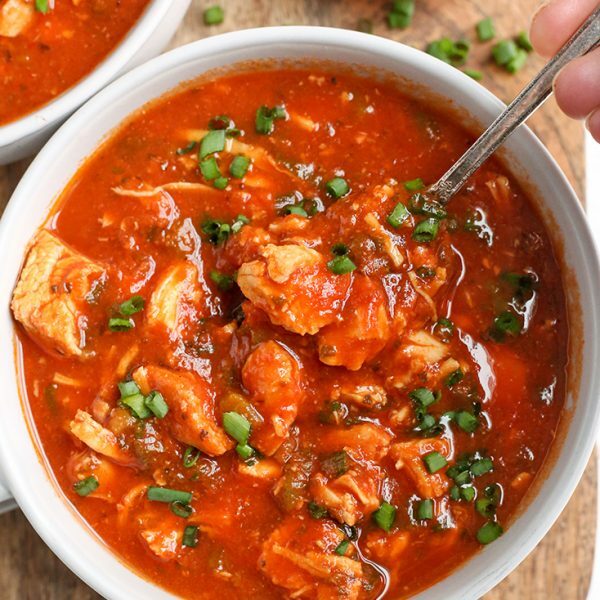 I’m always trying to come up with new flavors so we don’t get bored- 2 of our other favorites are the Paleo Lemon Butter Chicken and Paleo Chicken with Figs and Olives and people are loving those as much as we are! I came up with this idea just by looking what I had to use up and knowing how much we love pizza- it just made sense. It is super easy and I’ve made it so many times since then. I usually make double this amount so there’s leftovers for the week! Pull the skin back, add sauce and pepperoni. Pull the skin back over the toppings, drizzle with oil and top with seasonings. So easy!! The skin gets crispy, the edges of the pepperoni get crispy, the chicken is juicy and the sauce adds great moisture. It’s all works perfectly together! For the seasoning, I use Frontier Pizza Seasoning. I found it at my local health food store one day and knew I needed to try it. All the ingredients are real and even just the smell of it is just like pizza. Of course you can make your own blend if you want, but it’s so easy with the pre-made mix. *A little note about the pepperoni and Whole30. I have heard both sides- that the dextrose in it is such a small amount that it doesn’t matter and others saying yes, it still counts as added sugar. If you’re not comfortable using it during your Whole30 then wait until your done to make this dish. 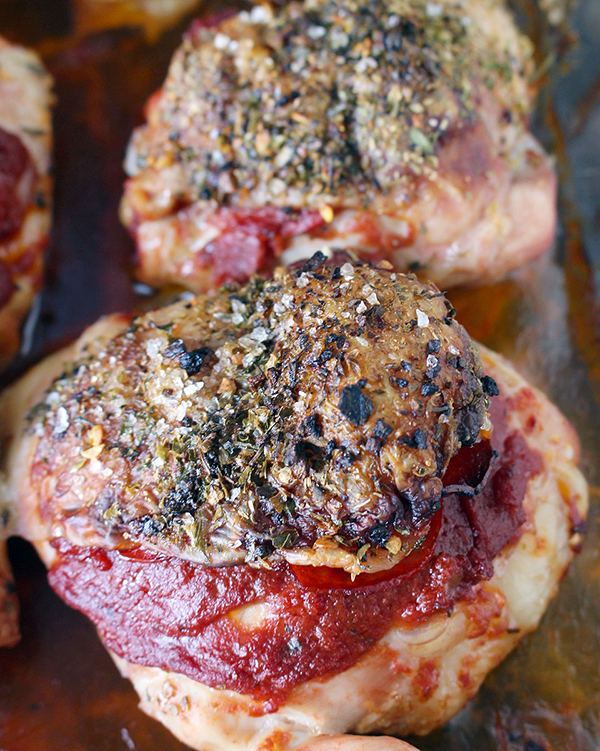 If you love pizza then you will love this chicken! It is easy and so full of flavor! 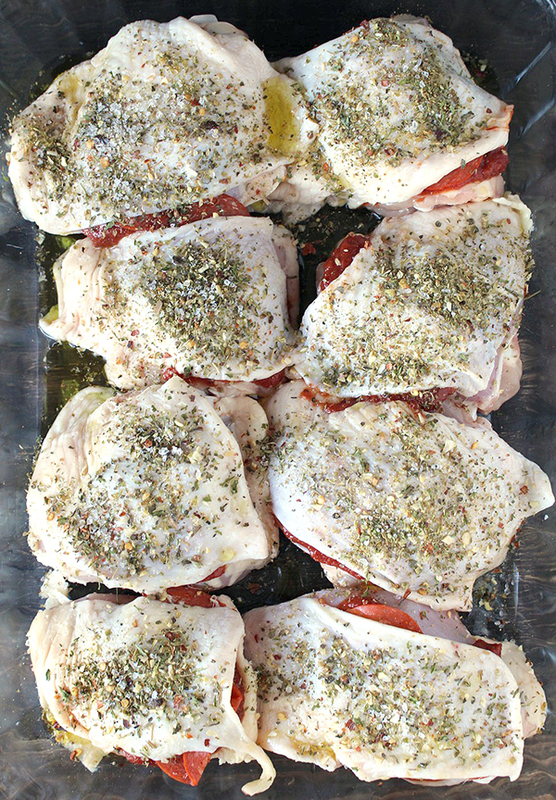 Preheat oven to 425° and place the chicken thighs in a 13x9 pan. 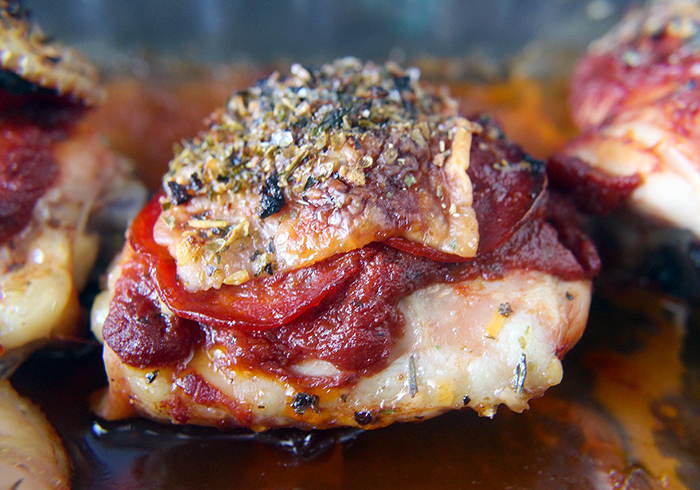 Pull the skin away from each thigh and place 1-2 tablespoons of pizza sauce on the chicken. 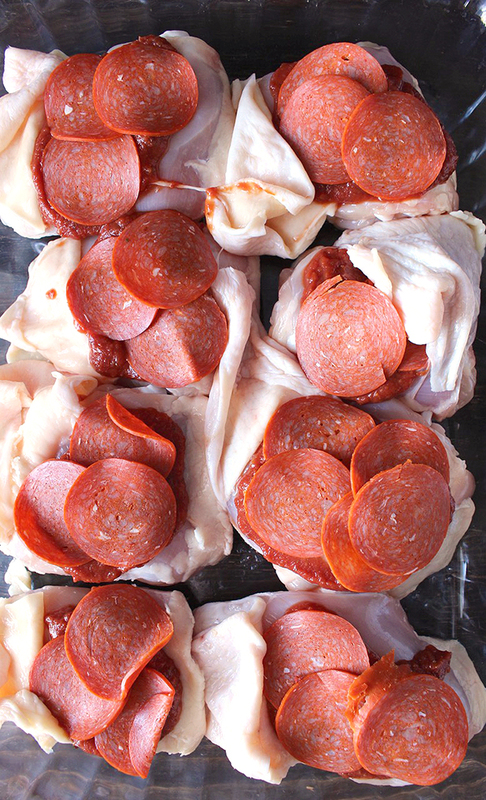 Top each one with 4-5 slices of pepperoni, then pull the skin back over, covering the sauce and pepperoni. Drizzle the oil on top of the chicken, sprinkle with salt and pizza seasoning. Bake for 40-45 minutes, until the skin is browned. What are some suggested sides for this dish? 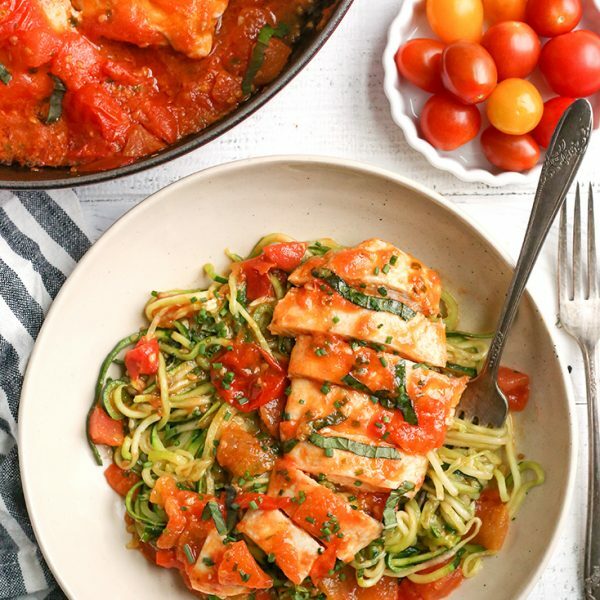 Hi Heather- roasted veggies, zucchini noodles, or spaghetti squash would all go with it. Hope you enjoy!